It is a prewar model, if I remember correctly, it is a 1937-38, making it one of the earliest survivors. 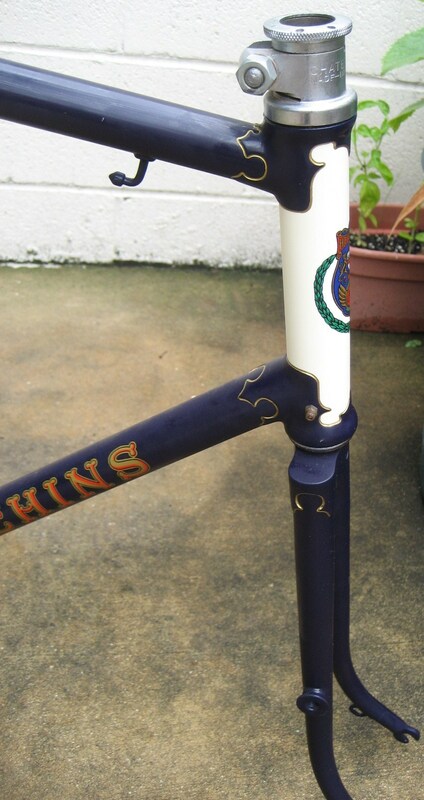 It is currently fitted with a Chater Lea headclip headset and Chater Lea bottom bracket. I think I am going to set it up as an internal geaar bike, with probably a Sturmey Archer TF rear hub. It takes 26 x 1 1/4″ wheels(597mm bead seat diameter). I have a Chater Lea crankset for it and Dunlop special lightweight rims. I would love to use upright North Road style handlebars, but I know that would be incorrect. 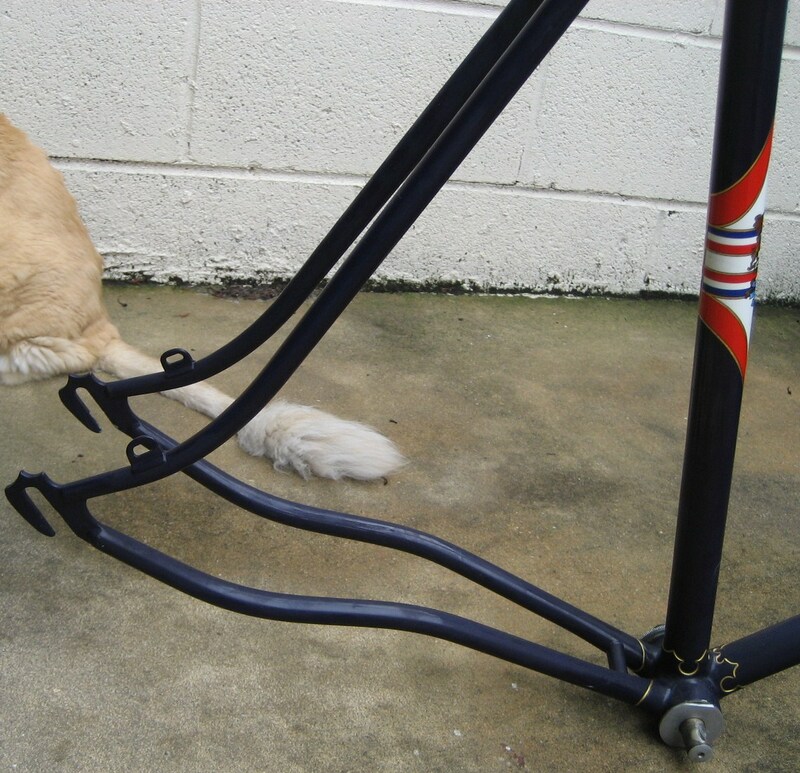 Will probably be some Reynolds alloy handlebars and stem. It is such a beautiful paint job, I feel like I can’t ride it, but I joked about putting it together to ride down to Cirque in Leesburg, VA this summer. I doubt I will, as I have so many projects ahead of this, and there is talk of riding down on a Bilenky tandem. That would be a lot of fun! I love distance riding and I can share with her the experience. Hopefully this year will not be 90+degrees out and a freak thunderstorm with mini tornados touching down in the area! Lovely frame. I have wanted, but in no way afford, a frame like that. If I had it, I would want to build it up with more modern parts, 700 wheels and the like, so I wouldn’t want something too nice to start with. 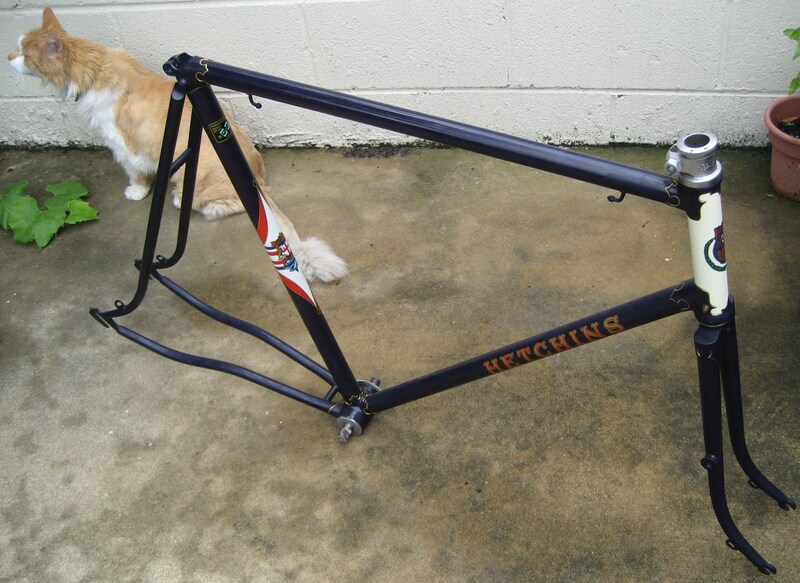 BTW, what is a “good” price for a Hetchins frame? Ideally, I would like a frame that was not as beautiful as this one. It is a little hard to see the finish, as it has some dust on it in the pictures. Having one built up practically would be great, and especially if it were to be ridden. That is one thing that becomes a problem with older bikes, restoring them with hard to find parts tends to make the owner wary of riding. It all depends on what the owner is trying to do. A good price is rather relative. There are many different models and they were produced for so many decades. Finding a frameset for $500-1000 is pretty good. I have seen complete bikes in that range was well, but to be realistic, they are few and far between. Beautiful body. I've desired, however by no means pay for, the body like this. Basically experienced this, We may wish to construct this upward with increased contemporary components, seven hundred tires and so on, and so i would not would like some thing as well good to begin with. BY THE WAY, just what “good” cost for any Hetchins body?